The Symphylan is an sporadic, but very destructive pest of many vegetable crops. Symphylans are not insects. They are more closely related to Garden Centipedes and Millipedes. Life cycle: Numerous generations per year. The adults spend the winter in the soil. 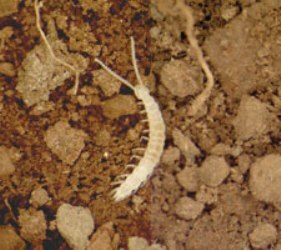 Physical Description: Mature Symphylans are white, a little less than 1/4-inch in length, with 12 pairs of legs and a pair of long-beaded antennae. Feeding characteristics: The Symphylan feeds on the roots (causing scarring) and underground plant parts. Plants may become stunted and die. Controls: Flooding with the hose may control them or tobacco tea poured into the soil for serious infestation. You may try Parasitic Nematodes, though this method has not been thoroughly tested.